Filed to: What The Hell Is This?Filed to: What The Hell Is This? Welcome back to What The Hell Is This?, where we harness our collective brainpower to identify mysterious new vehicles. 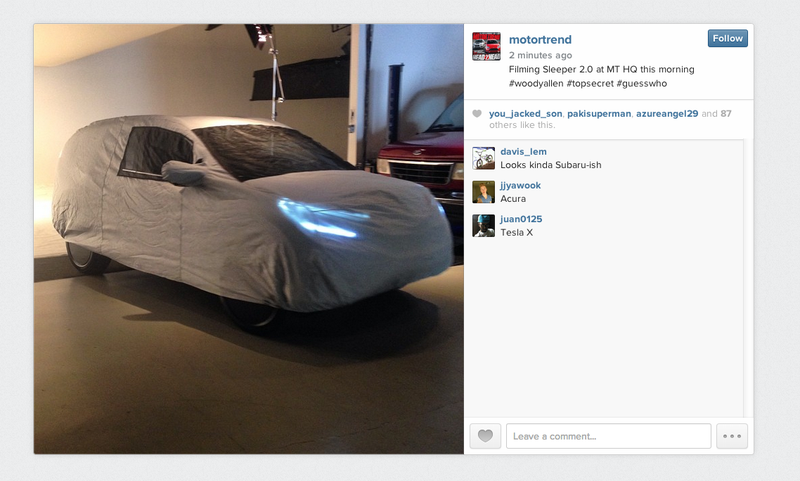 From Motor Trend's Instagram page comes a real head-scratcher of a crossover SUV. The buff book says only that they're "filming Sleeper 2.0 at MT HQ this morning" and closes the post with some mysterious hashtags like #woodyallen. I have no clue, y'all. Our guess is something Lexus-y, but it looks too small to be the new Lexus NX. One of their commenters suggested Tesla Model X, but I don't think it's that, either. Your guess is as good as ours. What the hell is this?